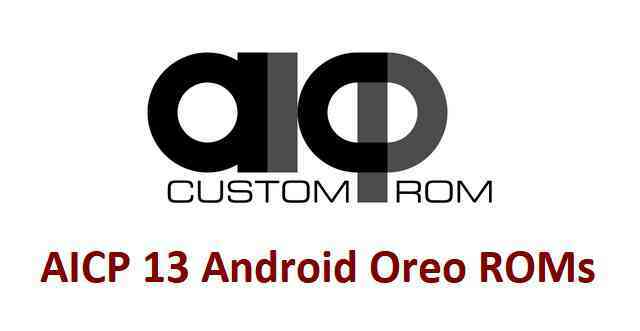 Android Oreo is released since a quarter and here is a list of available AICP 13 Oreo ROMs for various devices. The list is not so big right at this moment but I will be adding AICP 13 download and update guides as they will be made available by the developers across the globe. AICP stands for Android Ice Cold Project which was earlier based on AOKP ROMs and now is based on CyanogenMod sources or eventually Lineage sources as you all know that CyanogenMod will continue as Lineage OS. Unlike CyanogenMod/Lineage OS or Android, the versioning of AICP ROM is not straight forward. The Android Oreo version on AICP is AICP 13 ROM. Yeah I know the versioning of AICP is confusing but we are here to clear all of the confusion by maintaining a list of all available AICP Oreo ROMs. This is important because you must know which Android version of AICP ROM you are downloading for your phone, isn’t it !! As always the AICP 13/13.1 ROM does not come with pre-installed GApps (Google Applications) because of Copyright issues, so, you need an extra Android Oreo GApps. Also, AICP 13/13.1 does not come with built-in supersu or su binary for ROOT, hence you need and AICP 13 ROOT binary to be flashed after the AICP 13/13.1 (Android Oreo) ROM flashing. Link will be updated for AICP 13/13.1 rooting guide. What if your device does not have the AICP 13/13.1 Oreo ROM in the list? Well, it is possible that the ROM is not yet available or it’s just missing from our list. You can search for other Android Oreo or Nougat based ROMs list to find your device. Sir, OPPO A37f is only 1 year old, and very well known popular brand in India. I humbly requesting you sir for development of ROM of OPPO A37f. Thank you. Sir, there is no list of OPPO A37f in every post. Please sir, Make at least one Custom rom for OPPO A37f. Thank you.